Pharmacologic agents used in retina medicine are highly advanced and help to address a variety of neovascular and inflammatory conditions. However, despite the efficacy of current retinal therapies for posterior segment diseases, the armamentarium is ineffective in the presence of underlying photoreceptor cell death. Several emerging approaches to vision loss attempt to stabilize, restore, or grow new photoreceptor cells (ie, stem cell therapy) or harness the function of remaining viable retinal ganglion cells (ie, retinal prostheses). Yet the former is primarily invoked once loss of viability is apparent, while the latter is limited by electrode array technology and the challenges of overcoming altered retinal circuitry. Photoreceptor cell death is the underlying mechanism for loss of visual function in many retina diseases. Thus, photoreceptor cell death, and not cataract, diabetes, or age-related macular degeneration (AMD), per se, is the leading cause of untreatable blindness worldwide. Despite current excellent therapies, there is nothing to directly protect photoreceptors from programmed cell death. I believe this problem is the No. 1 unmet need in ophthalmology. There are 3 known mechanisms by which human cells can die: necrosis, which is a catastrophic, unplanned death event; autophagy, wherein the cell digests itself as part of a starvation survival mechanism; and apoptosis, or programmed cell death. Apoptosis is how most cells in the human body die. It is distinct from necrosis, which is chaotic death, and is the final common pathway for many diseases—not just macular degeneration, but a whole host of ophthalmic and systemic diseases. It is also a natural biological process and is needed for normal development, differentiation, homeostasis, and immune regulation. There are 2 pathways inherent to apoptosis: an extrinsic pathway, aptly named the death pathway, and an intrinsic, or mitochondrial, pathway (Figure 1). Both pathways also activate a related cell-death pathway called necroptosis, and both appear to share initiator and effector processes. In human medicine, a common treatment strategy has been to introduce agents against targets that are downstream in a pathologic pathway. Yet if a therapy could be introduced to counteract the most upstream trigger of apoptosis and necroptosis, the resulting downstream activity—including apoptosis and intermediate events that may contribute to decreases in cell function, viability, or activity—would be blocked. Neuroprotection is an emerging strategy in neurology, with a variety of compelling preclinical results now coming to the forefront for diseases affecting the central nervous system. However, proving clinical efficacy has remained elusive in systemic diseases. To this point there has not been much work in retinal neuroprotection, although it would seem that retinal neuroprotection would be an ideal mechanism by which to prove the concept. Retinal tissue is easy to target (ie, injection into the vitreous proximal to the retina), the retina is easy to visualize (by clinical examination or imaging), it is easy to measure the effect on function (visual acuity or contrast sensitivity), and the biology is now well understood. Thus, we are on the precipice of bringing a true neural protector into the field of ophthalmology. Met12 may be such an agent. It is a small 12-amino acid peptide segment of the oncoprotein Met, which provides prosurvival signaling in neoplastic disease. By mimicking the specific Met sequence that binds to the Fas receptor, Met12 also has prosurvival activity. In preclinical testing, Met12 prevented the activation of the apoptotic cascade and prevented photoreceptor death (Figure 2). Retinal detachment should be an excellent condition to demonstrate the therapeutic potential of Met12. Although modern surgical techniques result in approximately 95% anatomic success in repairing a macula-off retinal detachment, postoperative visual acuity is often significantly impaired. The average patient achieves about 20/50 acuity, and approximately 50% are 20/40 or worse. Most patients are more likely to have 20/200 acuity than 20/20, despite successful repair. Injection of Met12 had a protective effect in this animal model. Two months after the subretinal injection of Met12, 80% of photoreceptor cells that would have died due to apoptosis survived.6 Other endpoints including decreased activation of caspase 8 and a 77% reduction of the presence of TUNEL-positive photoreceptors (a reduction in the number of cells undergoing apoptosis) were observed.9 For a patient with a macula-involving retinal detachment, intravitreal Met12 could potentially dramatically improve postoperative visual acuity outcomes. Although the Fas receptor is homologous between rat and human, it is important to note that these data derive from preclinical work and clinical trials are needed to verify the concept of retinal neuroprotection in humans. 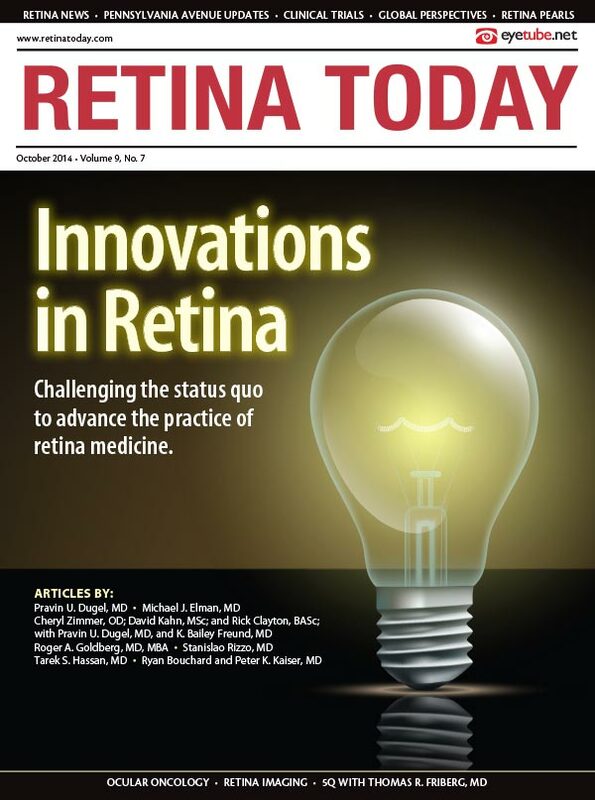 Retinal neuroprotection offers many intriguing and promising applications in the retinal therapeutic category. Apoptosis occurs whenever there is separation between photoreceptors and the RPE, regardless of causation. Even in dry AMD—a condition typically thought of as an atrophic process—drusen deposition results in RPE-photoreceptor separation in a similar manner as macula-off retinal detachment.10 It is foreseeable that Met12 or a similar inhibitor of photoreceptor apoptosis could be used in conjunction with other therapeutic modalities to preserve visual function in wet and dry AMD as well as other chronic and acute retinal diseases. Pravin U. Dugel, MD, is managing partner of Retinal Consultants of Arizona in Phoenix; clinical associate professor of ophthalmology, Doheny Eye Institute, Keck School of Medicine at the University of Southern California, Los Angeles; and founding member of the Spectra Eye Institute in Sun City, Arizona. He is a member of the Retina Today Editorial Board. He is a consultant to Acucela; Alcon; Genentech; Genzyme Corporation; Novartis Corporation; and Ophthotech Corporation. Dr. Dugel may be reached at pdugel@gmail.com. Zacks DN, Boehlke C, Richards AL, Zheng QD. Role of the fas-signaling pathway in photoreceptor neuroprotection. Arch Ophthalmol. 2007;125:1389-1395. Matsumoto H, Murakami Y, Mantopoulos D, et al. Membrane-bound Fas ligand has a critical role in photoreceptor cell death in an experimental model of retinal detachment. Invest Ophthalmol Vis Sci. 2013;54: E-Abstract 2851. Dunaief JL, Dentchev T, Ying GS, Milam AH. The role of apoptosis in age-related macular degeneration. Arch Ophthalmol. 2002;120(11):1435-1442. Arroyo JG, Yang L, Bula D, Chen DF. Photoreceptor apoptosis in human retinal detachment. Am J Ophthalmol. 2005;139(4):605-610. Almasieh M, Wilson AM, Morquette B, et al. The molecular basis of retinal ganglion cell death in glaucoma. Prog Retin Eye Res. 2012;31(2):152-181. Sairanen T, Karjalainen-Lindsberg ML, Paetau A, et al. Apoptosis dominant in the periinfarct area of human ischaemic stroke--a possible target of antiapoptotic treatments. Brain. 2006;129(Pt 1):189-199. D’Souza SD, Bonetti B, Balasingam V, et al. Multiple sclerosis: Fas signaling in oligodendrocyte cell death. J Exp Med. 1996;184(6):2361-2670. Zacks DN, Hänninen V, Pantcheva M, et al. Caspase activation in an experimental model of retinal detachment. Invest Ophthalmol Vis Sci. 2003;44(3):1262-1267. Besirli CG, Chinskey ND, Zheng QD, Zacks DN. Inhibition of retinal detachment-induced apoptosis in photoreceptors by a small peptide inhibitor of the fas receptor. Invest Ophthalmol Vis Sci. 2010;51(4):2177-2184. Johnson PT, Lewis GP, Talaga KC. Drusen exert degenerative effects on adjacent retinal cells. Invest Ophthalmol Vis Sci. 2003;44: E-Abstract 1723.